When I walk into Andy Everson’s studio on Comox Road I don’t know exactly what to expect, endocrinologist but standing face to face with a life-sized Star Wars Stormtrooper was not on my list. The Stormtrooper, over-painted with Northwest Coastal art to look like an indigenous warrior, stands inside the entrance like a sentry. At that moment, I know Everson is not your average artist, and this was not your average studio. As a teenager Everson became heavily involved in native dance and singing. Both were a way for him to express his connection to and share his cultural heritage, and it also led him into the world of art. “One year we needed some traditional blankets for a dance we were due to perform, but the ones we had were too old and valuable to take with us,” he says. “So I decided to try making some by painting large sheets of canvas.” The blankets turned out surprisingly well, and Everson realized that he enjoyed the process of creating. He went on to earn an undergraduate degree as well as a master’s degree in anthropology through the University of British Columbia. Although Everson was busy with his academic studies, it was at this time in his life that he started to pursue art more intensely. Everson laughs. “While putting off writing of my master’s thesis I started to draw more and more,” he says. “I finished my thesis but I also realized that I’d like to seriously pursue art. Unfortunately, I didn’t know a thing about approaching galleries.” Though uneducated in the art world at the time, Everson persevered, continuing to create his art and forging relationships with galleries. With time his art had a following. Today Everson’s following has grown by leaps and bounds, mainly through his most recent style of art, which combines pop culture with Northwest Coast art. Images like Lego, robots, Angry Birds, Canucks logos and Star Wars figures are not images you’d immediately pair with Northwest Coast art—yet it works, and it is creating new interest in First Nations art as a whole. Everson’s most notable use of pop culture is his Star Wars-themed pieces. “I’m a child of the 70s,” he says with a laugh. “Star Wars was my first real obsession. I collected all the toys and learned all I could about the series.” By pairing his love of Star Wars with the current issues facing his people, Everson has found a unique and effective way to raise awareness of those issues. As a whole, Everson’s Star Wars-themed series, Portrait of the Treaty Empire, discusses the misgivings and inner conflict that Everson feels surrounding the British Columbia Treaty process—negotiations that see governance of the reserves transferred from the federal government to the First Nations themselves. There are six images in the series, featuring characters such as C3PO, Darth Maul, Yoda and the Stormtrooper. Each represents a different aspect of the treaty process. There is Darth Vader, of course, who represents the dark side of treaty politics. “Our leaders, both native and non-native, get into politics generally with good intentions, but a lot of it gets corrupted and there’s a lot of corruption that happens at that level once they’ve found that power,” Everson says. According to Tim Strang, the marketing manager of Hills Gallery, Everson’s art has been tremendously popular. “Andy Everson’s art has always been well received here at the gallery. In fact, we have had a relationship with Andy since the beginning of his career. But the Star Wars series has been incredibly popular. Unlike many artists’ workspaces, in Everson’s studio there is a notable absence of art detritus like easels, brushes, and the smell of paint. Instead, the focal point of Everson’s studio is his desk with nothing on it but an extra large computer screen. The absence of the usual art equipment is explained by the fact that Everson creates the majority of his work on the computer. To create his art Everson literally draws on a computerized tablet, using a stylus. The image is then transferred to the computer as a file. Although he is incredibly competent on the computer now, it wasn’t always this way. “When I was in school I was so computer illiterate that I even paid my sister to type my papers for me,” he says, laughing. However, the computer still plays a part with the screen prints. “I create the design on the computer and then send the file to the printer, who will make a Mylar sheet from the design. That sheet will then be burned onto a screen for making the prints,” explains Everson. The three designs, called Interconnection, are the beaver, the thunderbird, and the whale, which represent land, air, and sea, respectively. 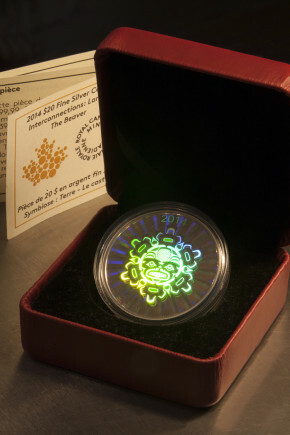 The coins are issued in either solid silver with a hologram finish, or in pure gold. Only 1,500 of the gold coins were minted and 7,500 silver coins are available.